Quick, easy and delicious dinner. Perfect meal for any day. Lay the chicken on a cutting board. Hold knife parallel to the cutting board and slice the chicken breast in half, one chicken breast is now 2 cutlets. Lay chicken between two sheets of plastic wrap and pound out with meat mallet to 1/4 inch thickness. Sprinkle both side of chicken with salt and pepper. Add just enough oil to cover the bottom of skillet. Heat oil between medium heat and medium high heat. Set out 3 shallow dishes. First dish, add flour and seasoned salt, stir. Second dish, whisk together egg, mustard, salt and pepper. Third dish add italian bread crumbs. 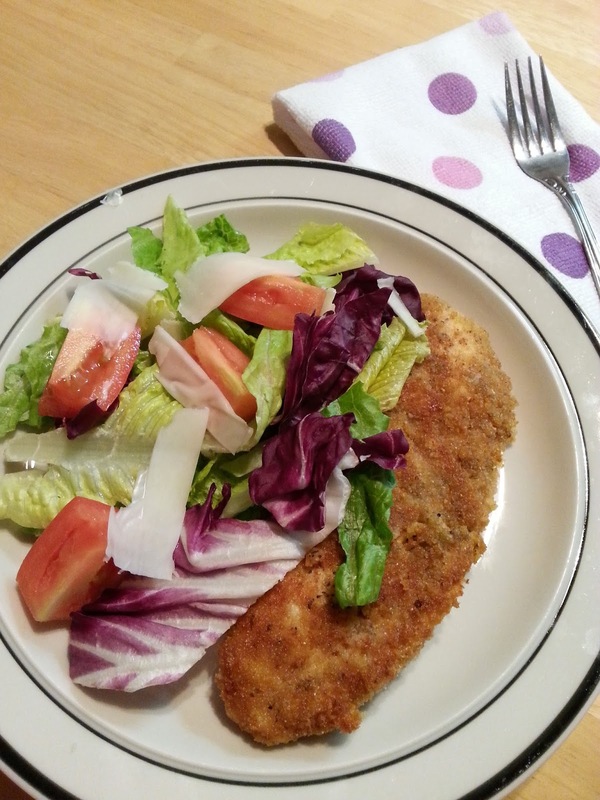 Dredge each chicken cutlets in flour, than egg mixture, than bread crumbs. Place chicken cutlets in hot skillet, cook about 3 minutes each side, until golden brown, and cook in batches. Preheat oven 250 degrees. Place metal rack on clean sheet pan to hold cooked crispy chicken cutlets and place in oven to keep warm while you finish cooking the chicken cutlets. This looks good and healthy! Thanks Christine! Nice looking blend in the seasoning for this chicken. I have done similar baked but sauteing would be crispier. I'll give it a try. Thank you! If you do give it a try, let me know what you think. Enjoy! Tried this. Tasted good. Keeper. Reminds me of being a kid. My Mom always made chicken cutlets!! Aw! Family memories. Love that. Thanks! Let me know if you decide to make this. I've been making something similar but without pounding the chicken. I love that you used mustard too! This sounds delish. I think I want chicken for dinner!